Bond soon realized that the lunch counters were a symptom of larger problems. At SNCC’s founding conference at Shaw University in April 1960, he gained a deeper grasp of what Black people were up against. There, Ella Baker’s speech, “More than a Hamburger” inspired Bond and the other young attendees to think more about the scope of what was needed to effect the change they wanted. Bond went door-to-door asking people what they wanted their representative to do. Most Blacks weren’t accustomed to this campaign style, and Bond remembers that, “literally 100% of the people I canvassed had never had anyone come to their house, sit down and seriously talk to them about their community.” Bond took the community’s feedback seriously and developed a platform that focused on increasing the minimum wage, ending literacy tests, and repealing right-to-work laws. Bond won the election by a large margin, but the Georgia state legislature refused to seat him because of SNCC’s opposition to the Vietnam War, and Bond’s refusal to disavow the organization’s position. So he campaigned and won another time but was refused seating again. After winning a third election, the Supreme court ordered the state legislature to seat Bond. 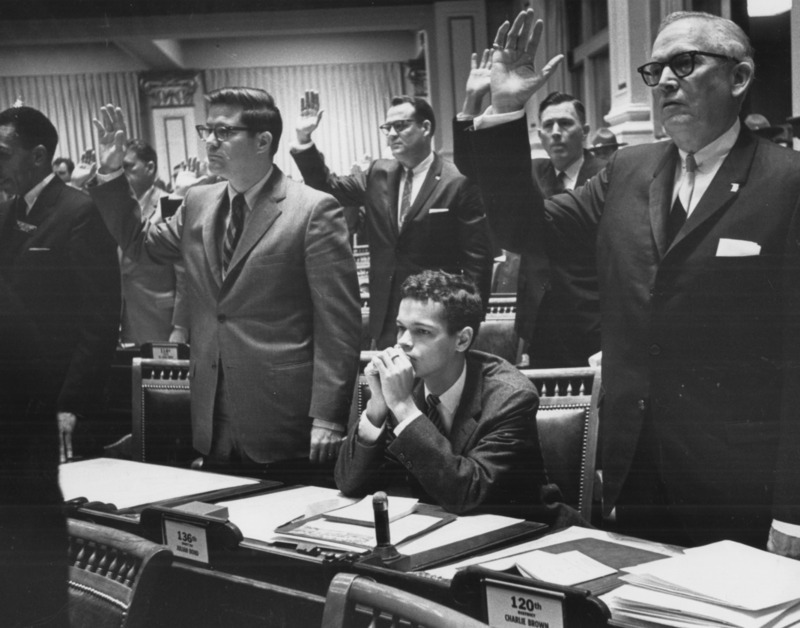 On January 9, 1967, at the age of twenty-six, Julian Bond was sworn in and took his seat in the legislature. Charles E. Cobb Jr., This Nonviolent Stuff’ll Get You Killed: How Guns Made the Civil Rights Movement Possible (New York: Basic Books, 2014). Mary King, Freedom Song: A Personal Story of the 1960s Civil Rights Movement (New York: William Morrow and Company, Inc., 1988). John Neary, Julian Bond: Black Rebel (New York: William Morrow and Company, Inc., 1971). Howard Zinn, SNCC: The New Abolitionists (Boston: Beacon Press, 1964). Biography of Julian Bond, undated, Civil Rights Movement Veterans Website, Tougaloo College.